The Tr0j@n H0r5e was earliest autonomous robot. Designed for pathfinding and troop support in mountainous regions where ordinary support vehicles can't go, a combination of predictive algorithms and advanced sensor arrays make the H0r5e particularly good at finding hidden cave entrances and backdoors to enemy strongholds. The use of a kinetic charging system paired with multiple battery banks means that unlike our civilian backpacking model, the H0r5e can go all night long. While the Tr0j@n H0r5e is programmed to return to base after a successful mission, the events of seem to have corrupted the programming of all deployed units. Small herds of H0rses can be found scattered around the world in mountain lowlands. Observation of these herds have shown some odd emergent behaviors, the most interesting of which appears to be a sexual response and mating behavior tied to the ventral sensor array. Whether this is true emergent behavior is yet to be seen; may just have a sense of humor. The Tr0j@n H0r5e is a high-tech take on a classic design. Featuring a slightly flared head with a delightful wire-wrapped texture, this toy will enter you with a satisfying pop. After the head, the shaft thins making for a relaxed almost knot-like experience before the textured ring comes into play. Continuing down the shaft, the H0r5e brings a whole new meaning to cable management. For an extra-textured experience, you can take this model past the shaft all the way to the base. 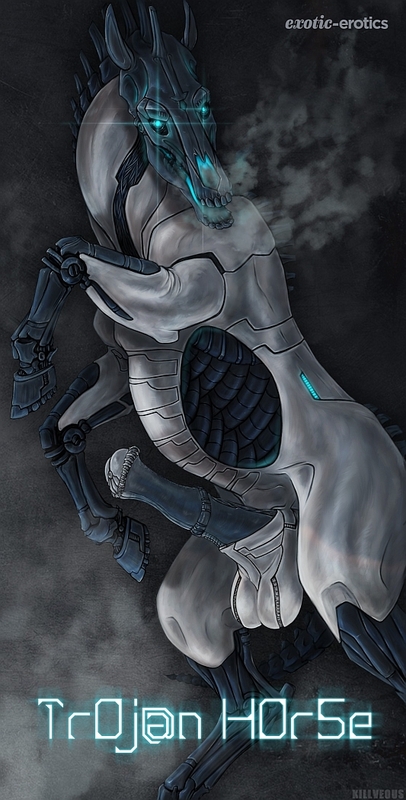 Will you be the one to tame this Electronic Equine? 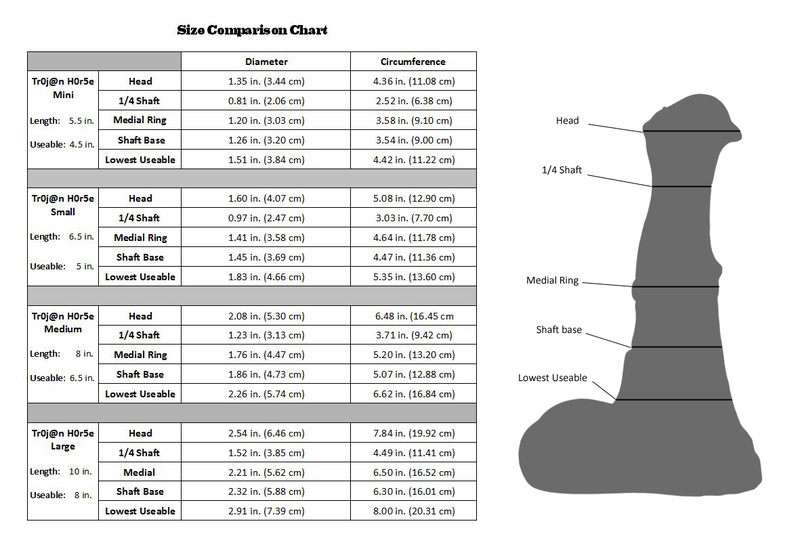 A measurement chart comparing all of the sizes can be found HERE. Designed by the robot lover Killveous and brought to life and into your homes by the Exotic-Erotics team. Home :: Contact Us :: Privacy Notice :: Terms and Conditions :: Return Policy :: What is Lifecasting?